Shaped by generations of anonymous folk performers who performed in kitchens, pubs, and celebrations throughout their country, Irish traditional music remains a complex and illusive art. Neverthelss, it has found its way into North American pop culture, where uilleann pipes are heard in introductions to top-40 tunes, new Age "Celtic" singers break out into mainstream radio, and the Irish supergroup Solas performs in a children's video for the Disney Channel. While these snippets of a vast musical tradition are introduced to the masses, behind the popularity remains a tapestry of beautiful regional dialects and revered folk composers whose art flourished for centuries beyond the mainstream of either "high art" or popular culture. You can enter this unique musical community of true Irish roots performers who've kept the light on for centuries-old tunes, but only after a long and discerning apprenticeship and a sustained relationship with this living tradition. Peformers Gearoid O'hAllmhurain (from County Clare, Ireland) and Patrick Ourceau (from Paris) enjoy unique and coveted positions within the extended family of Irish music makers on both sides of the North Atlantic. Gearoid is an accomplished multi-instumentalist, performer and music instructor, with several All-Ireland competitive titles on the concertina and uilleann pipes to his credit. He is also a former member of the renowned Kilfenora Ceili Band, the oldest traditional dance band in Ireland and seven- time All Ireland Ceili Band champions. Gearoid is also a faculty member at the University of San Francisco, where this leading Irish historian and anthropologist specializes in ethnomusicology. He has also released the new CD, "Traditional Music from Clare and Beyond," a collection of reels, jigs, and marches noted as one of the most important new collections of traditional music to be released in recent memory. The slow air of "An Paistin Fionn & An Cuisin Ban" is followed by the jigs "Miss Walsh & Apples in Winter," for example, for a taste of music loved and studied by generations of traditional Irish music masters. 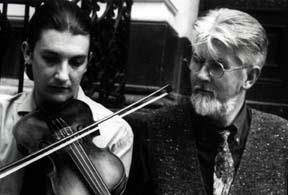 Patrick lived in Paris in the 1970s, when traditional Irish music was finding new audiences in Europe, particularly in France. He began to play fiddle and was inspired by fellow Parisians Vincent Blin, Herve Cantal and Michel Ferry. Meetings and sessions with Irish musicians Paddy Glackin, Gearoid O'hAllmhurain, and Garry Shannon eventually led him to Ireland, where he was introduced to the musical dialects of County Clare and East Galway. A move to New York City followed, so Patrick could become part of the Irish music scene which had been molded by generations of immigrant performers. Here he met Martin Mulhaire, Andy McGann, Paddy Reynolds, and other celebrated masters, as well as folk composers Jack Coen and Mike Rafferty from East Galway who fueled his interest in the music of Ballinakill and Aughrim. Patrick has become a leading fiddle teacher in New York, attracting students who've noted his broad knowledge of regional styles and abiding respect for the traditional masters. He is also becoming increasingly well-known as a composer, now that Solas has recorded his "The Four Kisses." Patrick continues to perform all over the United States, both with Gearoid, with the Washington, DC-based band Celtic Thunder, and in a new band with Eamon O'Leary and Greg Anderson that played on the new Irish-speaking television channel broadcast nationwide in Ireland.